Some residents at Points West Living Stettler were so excited about `the royal wedding’ they were almost ready to get up at 3-AM on May 19th, to watch Meghan and Harry tie the knot live on television. Most others were happy to watch a video recording of the proceedings the next day, after a good night’s sleep. The dedicated royalists decided to join them and they made an event of it. An impromptu tea party was pulled together so everyone watching could get into the spirit of the event. The PWL Stettler kitchen team worked diligently to provide plain and raisin scones along with bottomless cups of tea to residents gathered around the large screen TV. General Manager Carol Dyck and housekeeping care partner Andrea Laisnez, had both brought in their fine china tea sets for residents to use. 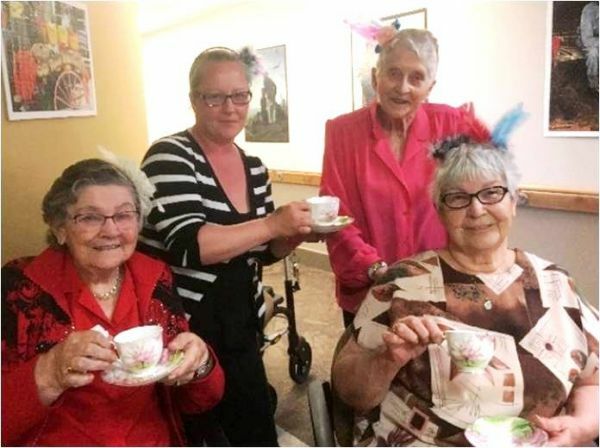 Photo: (from left) Audrey Wells, Andrea Laiznez, Jenny Gordon, and Marie Brenchley show off their fascinators and raise a cuppa’ to Harry and Meghan, at PWL Stettler’s Royal Wedding watch.